Michela Schiff Giorgini in the Temple of Soleb. Courtesy Nathalie Beaux. Michela Schiff Giorgini, an Italian archaeologist, was born on October 30, 1923 in Padua, Italy. 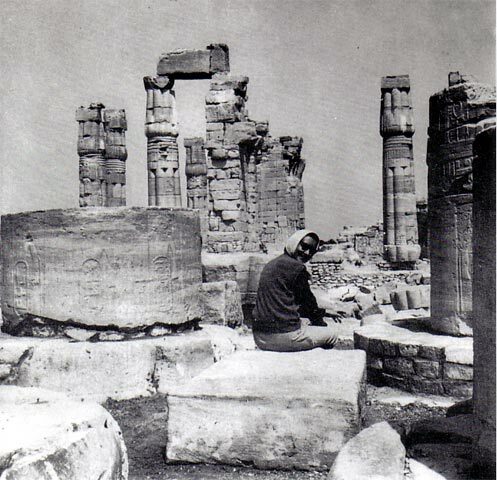 Under the Patronage of the University of Pisa, she worked for 20 years, 1957-1977, at Soleb on the Nile in Egypt at the 14th century BCE temple of Amenhotep III. She also excavated the tombs of the 18th Dynasty at Sedenga, the temple of Queen Tiy, wife of Amenhotep III as well as the tomb of Taharqa, a Kushite pharaoh of the 25th Dynasty. She published extensively, was honored by various organizations and retired to Spain where she died on July 3, 1978 from meningitis. Keywords: 18th Dynasty, 25th Dynasty, Amenhotep III, Aswan Dam, Delgo, Egypt, Gebel Gorgod, Italy, Khartoum, Kousite, Kushite, Légion d'Honneur, New Kingdom, Nubia, Padua, Pisa, Sedeigna, Sedenga, Sesebi, Soleb, Sudan, Taharqa, Tiy, tomb, UNESCO, University of Pisa.